Tori Zingarelli ’18, who sings in the Widdigers, Teller Chorus, and the WildChords a cappella group, is building her musicianship skills in AP music theory, and will be making music through Williston Scholars in the winter. She performs as a soloist every chance she gets in concerts and assemblies, and before games sings the national anthem. She dedicates so much of her time to her music and strives to make her performances consistently exceptional. She plans to focus on voice and music in college. Anna Harvey ’18 is working on an idea for a Williston-themed mural. She is focused, organized and has invested many hours in the project. 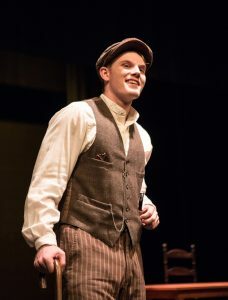 Harrison Winrow ’18 earned the role of the Stage Manager in Our Town. It is a challenging role for anyone, let alone a high school student. Harrison poured his heart into the entire rehearsal process, working hard to bring the character to life, despite the fact that it is like nothing he’s ever done before. He had a record number of lines to memorize, he only called for line (in rehearsal when an actor forgets a line they call “line” so they can get a reminder to jog their memory) maybe seven times. Everyone’s hearts broke when he got injured less than a week before we opened. His first thoughts were of the show. He wanted to get back in as soon as possible. Luckily, after speaking with everyone involved, we got the okay to put Harrison back in for our second show. Harrison got adjusted to his wheelchair, went out there, and gave it his all. While not everyone could or should do the same, our cast and crew was grateful that he was able to. Kassandra Orcutt ’19 is demonstrating all the skills needed to be a future captain of the Dance Ensemble. She often leads warm ups, helps others with rehearsing their chorography, and creates an inclusive and family atmosphere within the dance program. She can dance any style with ease and beauty. She is a wonderful role model within the program. Triniti Slaughter ’18, a dance captain, is a strong presence in the dance and theatre programs at Williston who knows how to support and motivate the other students, leading by example. Her hip-hop skills are off the charts. A’kayla Williams ’18, also a dance captain, is kind and supportive of every single student. In class, she is responsible and smart with her choreography and combinations. She’s an amazing hip-hop dancer. Congratulations to these Wildcats who devote their time and energy to their crafts!